Shhhh…don’t tell my husband, but I have a new love in my life. It showed up on my doorstep recently, and the good looks and sleek sophistication drew me in from the moment I unwrapped it. In fact I might have even given the Staples delivery truck driver a little squeal and a hug, but alas it wasn’t him I was excited to see…it was my new infatuation. I believe I can convince my husband that the three of us will live quite well together in perfect harmony. After all, this new love of mine doesn’t demand much. As long as I keep it filled with water it is perfectly content to sit quietly on my counter. Waiting for me to wake up in the morning and stumble down to it’s warm embrace, it never criticizes my morning breath or grouchy grumblings…and I bet my husband can’t say the same. So why wouldn’t he want to live side by side with this new love of mine? In fact, I might have seen him glancing it’s direction with a twinkle in his eye as well. Our entire family has developed a love affair with our new Keurig Vue! 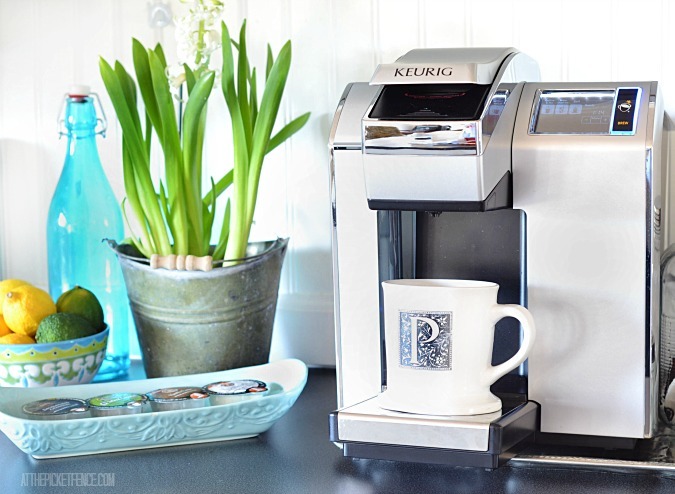 The Vue is the newest line of Keurig Makers and takes K-cup coffee to a whole other level! From Coffee to Hot Chocolate, Cider to Iced Tea the Vue can make all of your favorite brewed beverages. And let’s not forget my favorite…its ability to make Cafe drinks! 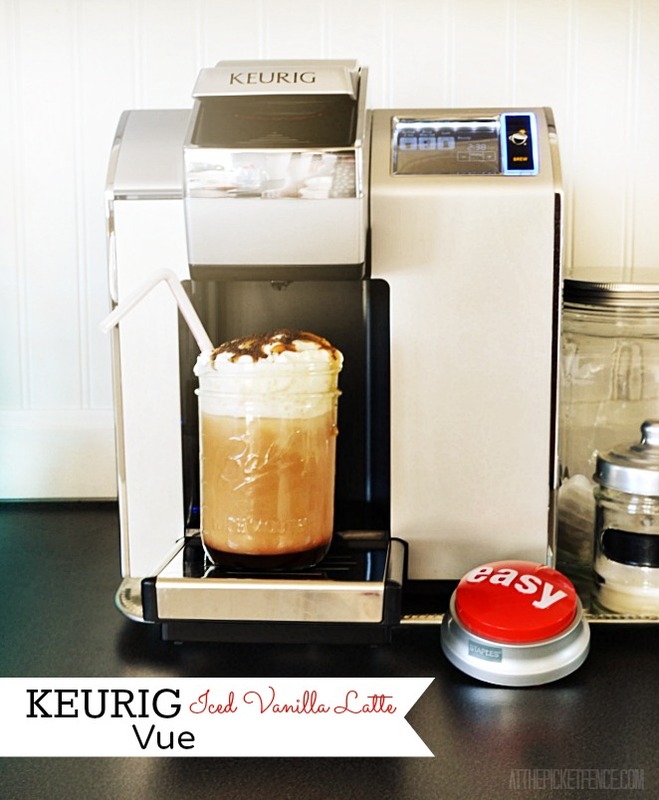 Here’s a quick and easy recipe I’ve created for a summer favorite…Iced Vanilla Lattes using the new Keurig Vue. With a few simple ingredients, I’ll show you how to make your own…. Besides the Vanilla Lattes, we are now to the Island Coconut Coffees (with a subtle coconut flavor) and we love these travel mug size Vue Cups from The Original Donut Shop! So, when visiting Staples for your office supplies be sure to hop over to the Keurig aisle and pick up your favorite Keurig products! 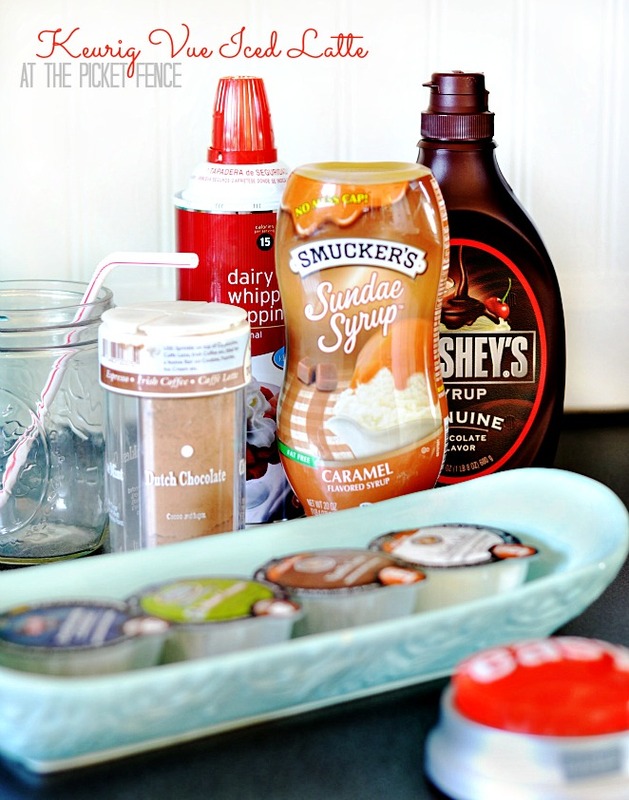 For some amazing Keurig recipes and recycling craft ideas visit our Keurig Board over on Pinterest! 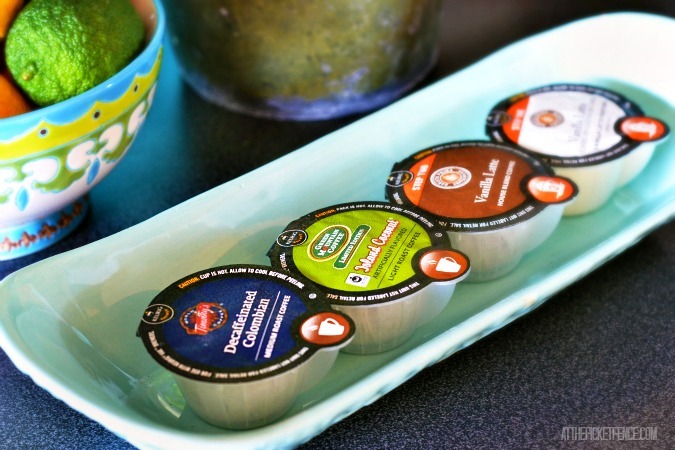 Do you have a favorite K-cup flavor? Spill the beans in the comments…I’d love to try some new flavors! Staples provided me with a Keurig Vue Coffee Brewer for this review. But all thoughts, opinions and full unadulterated love and devotion to my new Keurig is completely authentic and my own. To see their full line of Keurigs coffee makers, visit Staples.com. Click here to see our full disclosure policy. 52 Comments on "I have a new love in my life…"
Oh my goodness… that is the coolest! You never have to go to the coffee shop again! Thanks for telling us about it! It is cool! We are already so spoiled, and have placed our second order with Staples for some other types of drinks, the ice tea is really good too! Thanks for coming by Trish! Love it! Easy!!!! Thanks for the video too! Loved it! Love that it can do the hot chocolates and ciders as well and love the look of it. We just got a Soda Stream – but it isn’t as pretty. LOL. I bought a Keurig classic in November and I adore it! Lucky girl getting that one!!! Holy cow. I love that I can have a steaming hot fresh cup whenever I want. Have a fabulous week enjoying your new coffee maker! Love the video and you’re just adorable. I’m so glad your posted it! Now this almost makes me want to start drinking coffee! Maybe I could substitute Earl Gray Tea? 🙂 You’re a jewel! Heather you did a fantastic job on your video! What a cool machine! Ugh where to put one in my kitchen LOL! Thanks Anne! Was definitely worth making room for! lol We all love it! Thanks Jess! We really do love it, the kids like making their hot chocolate and iced tea with it too. Ugh..videos so wonderful and so awful all at the same time. 😉 Thanks for coming by! You are so CUTE! Love the video…love the Keurig! My favorite flavor is Dunkin’ Donuts! Ah, that drink looks so cute in that mason jar! If I were a coffee drinker I’d be ALL over that. I actually have a mini Keurig for hot chocolate and apple cider, but I cannot seem to trick my taste buds into loving coffee, even though I’ve tried. Heather your new toy has me jealous! We have the old version of the Keurig and I would really love to have a the new brew it cold or hot version. I love the fact that I have that need it now cup of coffee in the AM in the time it takes me to let me dogs outside and fill their food bowls. I’m sure your husband will forgive you for your new love. 🙂 I know mine loves ours. I have a Vue as well and I love being able to make a quick cup of coffee in the afternoon or a fun cafe drink. Love your recipe … I’ll definitely be trying it. And I’m off to check out your pinterest board. Thanks Randi! So glad we found the disposable cups today. 😉 That will make things a lot cheaper! No new flavor…just hot tea. But I love my Keurig…he is getting old though and maybe will need to replace by this new sexier model!! That’s one slick looking machine!! I may be due for an upgrade here… and YEAH on the easy latte! Never thought to add all the bells and whistles myself! Yum! I have had the regular Keurig for few years and we are thinking about upgrading to this in our new home. I am glad to hear that it is a great machine from one more person and a blogger I trust. I saw your announcement on fb awhile back about getting to review one of these! How super duper fun and exciting for you! I have been wanting a keurig but now I want the vue! And if you lived close enough I’d be dropping by for a latte! It looks like an awesome addition to your home. My husband would love this!! I’ve been in love with my Keurig since day one — four or five years ago. I HAVE to have fresh coffee (a 10-minute old pot of coffee is too old) so the Keurig method has saved many a pot of coffee from being tossed out. Nantucket Blend K-cups are sublime. That is one cool machine…I drink about a pot of coffee a day…so never thought that the Keurig would be economical for me…but when they add those features?…hmm, I may need to rethink that!! Ohmygracious … that looks absolutely sinful! Our *original* Keurig is about to bite the dust … just might have to step it up a notch and grab one of these! I saw that one of your K cups is from Timothy’s. Our good friends (Canadians) owned that company. They had over 200 coffee shops throughout Canada and were in direct competition with Starbucks. They sold their company to Green Mountain for a gazillion dollars. They can now be found living in their home in London, their summer cottage on an island they own in cottage country north of Toronto, their Florida mansion in the cold months, or traveling with us. What a life. I LOVE my keurig machine – seriously, I don’t think I could live without it! I am all the about the Caribou Daybreak – just the right amount of strength with no bitterness. We live and breath by our Keurig and I didn’t realize they had this no two step system. Now to convince my husband! Oh I love my Keurig Vue! I’m definitely going to try your recipe! Thanks for sharing! Loved your review of this new Keurig machine! We have debated whether we should buy a Keurig because we go through a lot of coffee at our house. Currently we have an espresso machine to make lattes, but it takes several minutes to make one. We also have a regular coffee maker and end up dumping a lot of coffee which is so wasteful. I have just one question for you. Does the Keurig machine get the coffee really hot? That’s our problem with so many machines and coffee makers that are on the market now. Hi Jane! We were dumping a lot of coffee too because my husband likes to make a full pot but then it gets cold and no one drinks it…lol The Vue has temperature control and brew strength control! How awesome is that?! 😉 Also, Kohls carries online and in store a re-usable Vue cup that you can use your own grounds in to save some money. Do you know if there is any difference between the one you own and the regular (non-professiona) Vue, as far as the capabilities? Hi Susan. No, not really. Regular (home) Keurig Vue models have 8 different cup sizes, 74oz removable water reservoir, removable & adjustable drip tray, auto on off and they use same technology. You can also make hot and cold drink, regular or strong, coffee, tea, hot chocolate. But, they are much cheaper and they are recommended for home use. If you’re buying a coffee maker for your home, V500, V600 and V700 will definitively do the job. I hope this helps. A latte is just steamed milk and espresso (coffee). When you add the cholcolate, then we call it a mocha! That’s how we do it in the coffee capital of the world, Seattle. I recently got a Vue to try from House Party and I LOVE IT. But I had to comment to say that yours is SNAZZY! I love the sleekness and the square button! I’ve tried the vanilla latte hot but I didn’t even think about making it cold – I’m definitely trying that. I also have the mocha on its way to me and now I plan on trying it hot AND cold. Thanks! 25 Delicious Coffee Recipes - Lattes, Frappes + MORE! hack tokens cash and fans updated september 2013.